Dennis Duane Mues, of Cambridge, passed away at Tri Valley Health Systems on December 7th, 2018, at the age of 67 years, 9 months, and 1 day. Dennis was born March 6th 1951 at Fort Riley, Kansas to Donald and Marjorie (Oakham) Mues. He attended several schools, as was common for a military family. He graduated high school from Bartley High School with the class of 1969. Dennis was united in marriage to Glenda Rae Brooks June 5th, 1970. To this union were born 3 sons, and 1 daughter. Dennis was preceded in death by his father, Donald. three sons, Darren and wife Tami, of Holdrege, Ne; Dallas and wife Kimberly, of Bartley, Ne; Dustin and wife Jen, of Culbertson, Ne; one daughter, Mysti and husband Daniel Killough, of Holdrege, Ne; one brother; four sisters; eight grandchildren; four great-grandchildren; and a host of family and friends. He started working at a young age at the Cambridge Alfalfa Mill. He then worked as a Lineman in Ransom, Kansas, before returning to Nebraska to work for the Co-Op in Cambridge. He also worked as a Mechanic for Budke Motors in McCook, and Burton Well Drilling in Bartley, before starting Mues Well Service in 1986 where he continued until being forced to stop due to declining health in 2014. When confined to home, he avoided boredom by spending much of his time keeping busy with his grandchildren, as well as his many art projects. Several earned ribbons and awards at competitions. Dennis enjoyed all things outdoors. Many days and nights were spent hunting and fishing. If you knew him, you were aware no wild animal was safe from the family dining table. He also enjoyed trapping, and took great pride in selling his furs. He was a modern day mountain man. The entire family would pack up for black powder mountain man rendezvous. He was an exceptional marksman. There were a few shooting competitions that Dennis would take pride hearing people proclaim they almost didn’t want to compete if there was no chance of getting a trophy because the Mues Clan was shooting. 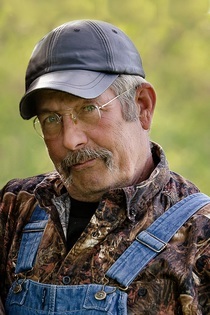 Dennis also taught many young individuals as a hunter's safety instructor for many years. Other times you might have found Dennis doing some amateur archeology as he enjoyed walking fields after a fresh rain looking for arrowheads. Another source of pride for Dennis was the Mues family farm. He watched his grandpa Rudolph’s hard work, his uncle Ken continued that work until his ailing health prevented it. It was at this time that Dennis took over the Mues farm. Even as his health was failing you could find Dennis working the fields. plus mile journey to Boise Idaho for his father’s funeral. He enjoyed poker runs with the Zoo Crew and was proud of the money they had raised for so many people in need. He and his trusty sidekick “Dino” the duck would go nearly anywhere together on the old Pan. One thing about Dennis that everyone will agree with, is that there was the wrong way, the right way, and then there was Dennis’ way. His way wasn’t wrong, but it most likely wasn’t the easy way either. It also wasn’t the fastest way. Anyone who had ever shot a gun in a competition against him will attest to that. If it was worth doing, it was worth taking your time to do it right.